One of the biggest stories in the energy world right now is the fallout after French President Emmanuel Macron caved on new motor fuel taxes, suspending their implementation for 6 months after rioters flooded Paris. Why it matters: I'm not an expert in French politics and won't pretend to understand all the dynamics at play here. But, the tumult at least partially signals the challenge of carbon pricing and raising fuel costs as a way to combat global warming, even as pricing regimes expand to more places. Driving the news: There's a race underway to define what just happened — and some misinformation is flying around already. Yesterday afternoon, as Axios' Khorri Atkinson noted, President Trump inaccurately tweeted that Macron's decision signals his agreement that the Paris climate deal is "fatally flawed." But, but, but: While Trump is wrong about Macron's posture, it's true that the French mess can't be untethered from climate policy. "Leaders in the United States, Canada, Australia and elsewhere have found their carbon pricing efforts running into fierce opposition," the Washington Post pointed out last night. Where it stands: Conservatives have seized on the French action as activists on the right celebrate Macron's retreat. Just before Macron backed off, Americans for Tax Reform circulated this piece from the Wall Street Journal's conservative editorial page. It calls the French protests part of a wider global pushback against carbon pricing — including the election-day failure of a proposed CO2 tax in Washington state. "[T]oday’s carbon prices — while slowly rising — are still too low to have a significant impact on curbing climate change." Macron's fuel tax retreat arrives as advocates of carbon taxes in the U.S. are trying to chip away at the overwhelming political resistance to the idea among GOP lawmakers. This includes the Climate Leadership Council (CLC), a group aligned with several Republican elder statesmen. What they're saying: "The events in Paris reinforce the importance of rebating carbon fee revenue directly to the public, which is not only the most equitable option, but also the most popular," CLC's Greg Bertelsen tells Axios. "[I]t’s another setback for any policy that increases energy costs, which unfortunately includes just about every serious climate policy," he said in an email exchange last night. "The nice thing about carbon pricing is that the revenues can be used to offset these increases in energy costs. But France wasn’t planning to use the revenue for that purpose." Meanwhile, some experts and advocates are also cautioning against drawing wider conclusions about what happened overseas. This Twitter thread from the Niskanen Center's Jerry Taylor, for instance, points out the big difference in fuel prices between France and the U.S. And we've got more on that just below, too. Violent protests in France over a now-shelved plan to raise gasoline taxes highlight the country’s comparatively high pump prices, Axios' Amy Harder notes. The big picture: People around the world pay vastly different prices to fuel their gasoline-powered vehicles, depending on how the country in which they live subsidizes or taxes the fuel. The chart above offers a snapshot of 4 countries with different price profiles. Oil-rich Saudi Arabia subsidizes its gasoline much more than most other countries. France, along with most Western European nations, has high taxes while car-dependent America has relatively low prices compared to its global counterparts. Behind-the-scenes moves are underway ahead of the pivotal Dec. 6–7 OPEC meeting in Vienna. Where it stands: Via Reuters, "OPEC and its allies are working toward a deal this week to reduce oil output by at least 1.3 million barrels per day, four sources said, adding that Russia’s resistance to a major cut was so far the main stumbling block." The intrigue: Per Bloomberg, "U.S. special representative for Iran Brian Hook met with Al-Falih in Vienna on Wednesday, according to a person familiar with the matter." Electric vehicles: The EV charging company FreeWire Technologies — which builds mobile charging units — said Tuesday that it has closed a $15 million series A funding round from backers including BP and Volvo. Other backers of the California-based startup include Stanley Ventures, Blue Bear Capital, Oski Clean Energy Partners, Strawberry Creek Ventures, Spike Ventures, TRIREC, the company said. Why it matters: Money is coming into the expanding EV charging space from big legacy energy and auto companies, venture capital and elsewhere. The big picture: It follows the late November news that ChargePoint, a much bigger and more established EV charging player, has raised another $240 million. Home energy: Tendril, a data analytics company that works with utilities, said it has secured a majority investment from the private equity firm Rubicon Technology Partners. Greentech Media chatted with Tendril CEO Adrian Tuck, who said the move will provide a "good exit for our existing shareholders." Per Greentech, they include VantagePoint Capital Partners, Good Energies, Appian Ventures, Access Venture Partners, Vista Ventures, RRE Ventures, TIAA-CREF, GDF Suez and SunPower. 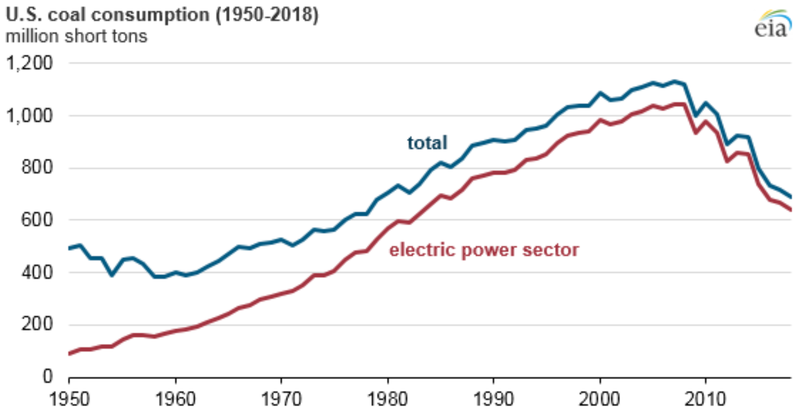 Screenshot of chart in EIA report, "US coal consumption in 2018 is expected to the the lowest in 39 years"
The Trump administration is about to unveil its latest move to aid the coal industry, even as more evidence emerges showing why it's such an uphill climb. Driving the news: Axios' Amy Harder reports that EPA is set to announce Thursday that it's weakening an Obama-era rule that had required costly technology capturing carbon dioxide emissions on new coal plants. Why it matters: This is the latest regulatory rollback effort by Trump in his attempt to revive America’s coal industry that's declining in the face of cheap natural gas and tougher environmental rules from the last administration. Trump's EPA is set to announce that such carbon-trapping technology is no longer required for new coal-fired power plants. These rules are parallel to another Obama-era rule setting emissions standards for existing power facilities, which the EPA is in the process of replacing as well with a far less stringent standard. But, but, but: New coal plants are nonetheless unlikely in the U.S., no matter what Trump does, because of cheap and cleaner-burning natural gas, along with increasingly cheap renewables. Most utilities think coal will eventually face some sort of CO2 standard, so even though Trump is rolling back such rules now, they’re staying the course. The big picture: News of the upcoming rule is emerging alongside more evidence that the administration hasn't yet succeeded in stemming coal's years-long decline in U.S. power markets. The latest: The Energy Information Administration, in a short report Tuesday, said that U.S. coal consumption is declining another 4% this year to reach its lowest level since 1979. What's next: The tiny emirate, currently under a Saudi-led blockade, plans to increase its annual production of LNG from 77 million tons to 110 million tons in the coming years. Over recent years, Saudi Arabia and other OPEC members have pressured Qatar to maintain the link of its LNG prices to oil. But as global natural-gas markets become more competitive and flexible pricing more imperative to growing the fuel's market share, oil-based pricing is no longer convenient, especially in light of more abundant U.S. natural-gas exports and increasingly inexpensive renewables. Leaving OPEC will make it easier for Qatar to ignore such price-linking concerns. The intrigue: The withdrawal comes against the backdrop of Trump's frequent (and legitimate) complaints that OPEC inflates oil prices to the detriment of the global economy, and especially to key emerging-market countries. The U.S. Congress has also weighed in by advancing legislation that would authorize the U.S. attorney general to file anti-trust charges against OPEC. What to watch: Qatar has an equity stake in the U.S. Golden Pass LNG export facility, which is expected to receive approval to move forward shortly. By quitting OPEC, Qatar ensures it can put its best foot forward as a supplier of lower-carbon energy while staying clear of any negative associations OPEC membership might have in the eyes of U.S. leadership. Amy Myers Jaffe is the director of the program on energy security and climate change at the Council on Foreign Relations.